Please note that this current website does not have a shopping cart. 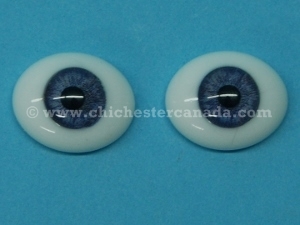 To buy our Antique Prosthetic Glass Eyes online, please go to our e-commerce website at NaturalExotics.ca. These antique glass eyes were hand-blown from glass to form the basic eyeball. The iris was made seperately and was then attached to the round ball to form a useable piece. We have two styles available: the Round style or the Flat-back style. The round pairs are the traditional hand-blown eyes: spherical, seamless with a 1/16" hollow stem back. The flat back pairs are just as described: rounded on top, flat in the back. Both styles are available in brown, blue and green. Please see the gallery below for available pairs. Each pair is unique. The eyes make for great conversation pieces, especially when placed in the bottom of a Martini glass!